When sailing his house on the wooded sea, green moss pillows rose against the eaves. And upon the rolls of wave shed leaves, floated this princess and pauper king, silently sailing in moonlit peace, eating smoked salmon and squeezing these links. 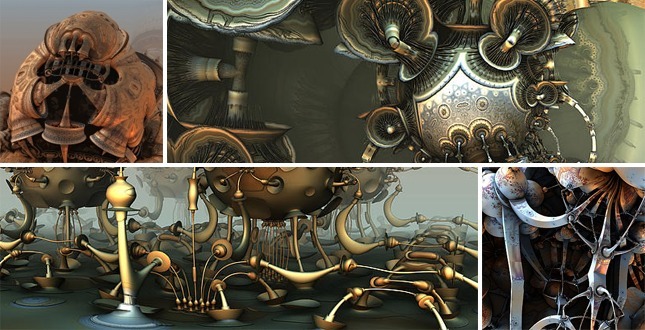 Hal Tenny – Wonderfully expansive fractal art (made using Mandelbulb 3D and Apophysis) to add a little 3-dimensional intricacy to your weekend. Time is Nothing – Around the world (17 countries) in 343 days. 6237 photos in a little under five minutes. Consider yourself traveled. How to give and ask for a raise – The best time of year to do it is over, but that doesn’t stop your scheming for this year. Top 10 recut Movie trailer – I love a good movie trailer of a comedy… that’s been recut to look like a horror film. That and more. Essential Geography – of the United States. The most excruciatingly detailed map every created. 60 second adventures in Thought – What have been the most challenging mind conundrums of the past several centuries? This animated video will give you something to chew on.